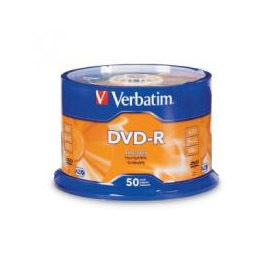 Verbatim DVD-R 4.7GB 50Pk Spindle 16x : 95101Verbatim DVD-R offer 4.7GB or 120 Minutes of write-once storage capacity, superior recording quality, and compatibility with 1X to 16X DVD-R writers. Verbatim 16X DVD-R discs allows users to record a complete 4.7GB/120Min disc in approximately 5 minutes. Recognised as the choice of professional users, Verbatim DVD-R offers the optimal Advanced Azo recording dye, which provides the highest level of read/write performance, reliability, and archival life. Verbatim 16X DVD-R media is compatible with Pioneer, Apple, Sony, Panasonic and other leading drive manufacturers. As with all Verbatim optical products, these discs are backed by a Limited Lifetime Warranty.Key Features :Compatible with up to 16X DVD-R Hardware Advanced Azo recording dye optimizes read/write performance Ideal for recording up to 2 hours of DVD quality home movies and video clips Archive and back up, up to 4.7GB of important data Compatible with 16X DVD-R drives from Pioneer, Apple, Sony, Panasonic and others Read compatible with most DVD-ROM drives and DVD video players Limited Lifetime Warranty.